"A luminous, Marquez-esque tale" (O, The Oprah Magazine) from the New York Times bestselling author of The Museum of Extraordinary Things: a forbidden love story set on a tropical island about the extraordinary woman who gave birth to painter Camille Pissarro—the Father of Impressionism. Growing up on idyllic St. Thomas in the early 1800s, Rachel dreams of life in faraway Paris. Rachel's mother, a pillar of their small refugee community of Jews who escaped the Inquisition, has never forgiven her daughter for being a difficult girl who refuses to live by the rules. Growing up, Rachel's salvation is their maid Adelle's belief in her strengths, and her deep, life-long friendship with Jestine, Adelle's daughter. But Rachel's life is not her own. She is married off to a widower with three children to save her father's business. When her older husband dies suddenly and his handsome, much younger nephew, Frédérick, arrives from France to settle the estate, Rachel seizes her own life story, beginning a defiant, passionate love affair that sparks a scandal that affects all of her family, including her favorite son, who will become one of the greatest artists of France. 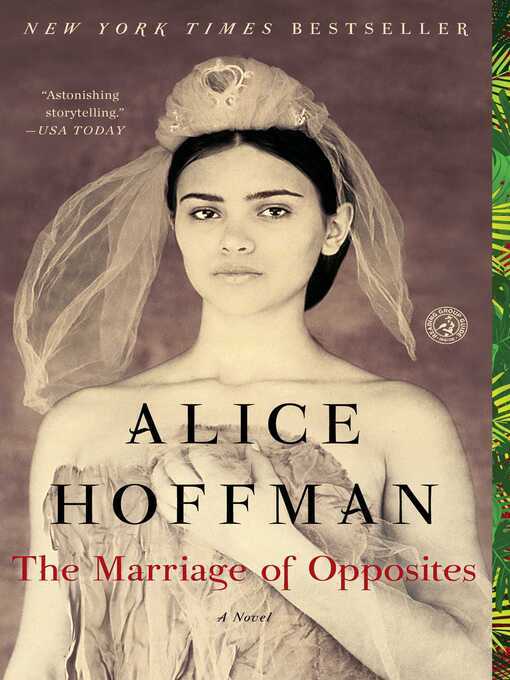 "A work of art" (Dallas Morning News), The Marriage of Opposites showcases the beloved, bestselling Alice Hoffman at the height of her considerable powers. "Her lush, seductive prose, and heart-pounding subject...make this latest skinny-dip in enchanted realism...the Platonic ideal of the beach read" (Slate.com). Once forgotten to history, the marriage of Rachel and Frédérick "will only renew your commitment to Hoffman's astonishing storytelling" (USA TODAY).